Most people burn the candle at both ends, don’t get nearly enough sleep at night, and struggle to get through the day. Luckily, there is an all natural, safe way to restore tired muscles, and feel better fast. 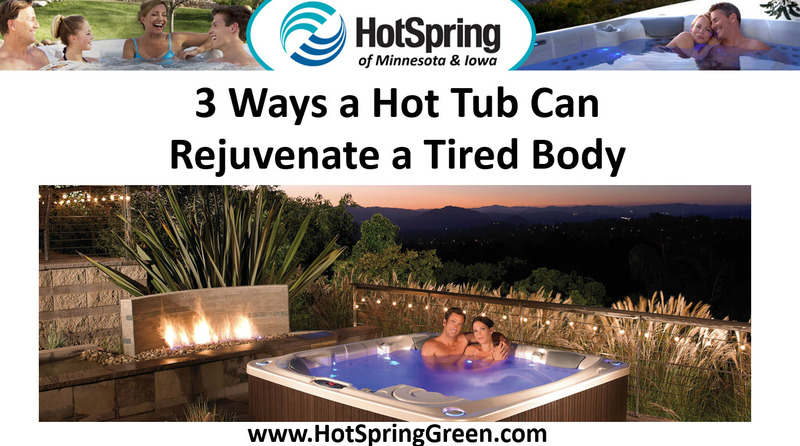 Here are three ways a hot tub can rejuvenate a tired body for a great night’s sleep. Relax and Restore – If you’ve ever had tight shoulders or dealt with a tension headache, you know how tough it can be to concentrate. In just fifteen minutes, soaking in hot water breaks down tension and stress that create pain in the body, replacing it with relaxed, soothed muscles and joints. Get the Rest You Deserve – Take a relaxing, quiet dip in the spa 30 minutes before bed and you won’t believe how effortless it is to fall asleep. It has to do with body temperature. A soak raises your temperature, and when you get out it decreases. This is the body’s way of preparing for sleep, and it works every time. Give Yourself a Time Out – Hot, massaging water targets muscles and joints deep at the core, where pain and stiffness generate. Within minutes, a soak can leave you restored, reenergized and refreshed—the perfect combination for high productivity and increased stamina.